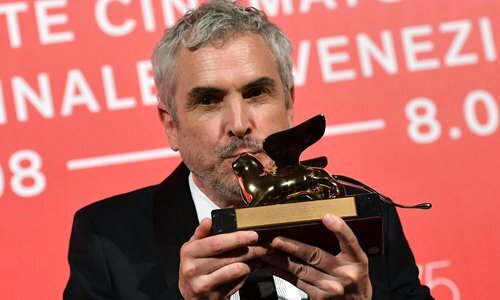 Mexican director Alfonso Cuaron won the Golden Lion top prize at the Venice film festival Saturday for Roma, which critics called not merely a movie but "a vision." With its highly emotional story centered on an indigenous maid working for a middle-class family in Mexico City in 1971, it has been hailed as Cuaron's most personal film - and also his best. The film industry bible Variety said Roma is likely to go down as a "masterpiece." "It is no mere movie - it's a vision... where every image and every emotion is perfectly set in place," said critic Owen Gleiberman. The Italian press declared it "sublime" while for The Guardian's Peter Bradshaw it was a "complete triumph." Venice has become the launchpad for the Oscars race with Hollywood heavyweights jostling for attention in a line-up director Alberto Barbera called "the best in 30 years." "Cleo is based on my baby-sitter when I was young. We were a family together," Cuaron told AFP. The second prize Silver Lion went to France's Jacques Audiard for his hugely enjoyable Western The Sisters Brothers starring Joaquin Phoenix and John C Reilly. Another Wild West tale, The Ballad of Buster Scruggs by the Coen brothers, won best script. Having missed out on an Oscar last year, Willem Dafoe took best actor for his acclaimed portrait of the painter Vincent van Gogh in At Eternity's Gate. Britain's Olivia Colman took best actress for playing the needy and weak-minded Queen Anne in The Favourite, a viciously funny and apparently accurate historical drama about two powerful women competing for her favor. Colman, 44, who is playing Britain's present monarch in the television series The Crown, said she "loved every second" of playing her 18th-century predecessor, "even if none of us knows what it is like to be a queen." The film's Greek director Yorgos Lanthimos won the Grand Jury Prize. It was one of several movies with strong female stories vying for the Golden Lion - with all three of its leading actresses tipped as Oscar contenders. Even so the organizers were lambasted for choosing only one female director among the 21 competing for the top prize for the second year in a row. Australian director Jennifer Kent did however win the special jury prize for The Nightingale, her stirring story of revenge and friendship involving an Irish convict woman and an Aboriginal tracker in colonial Tasmania. Pop superstar Lady Gaga made a highly praised big screen debut playing a ballsy young waitress who dreams of being a singer in A Star is Born. And the three main characters in the winning film Roma were also women. Cuaron made his name at Venice in 2001 with his sensual Spanish coming-of-age movie, Y Tu Mama Tambien, before going onto to Oscar glory with Gravity, which also premiered at the festival. A similar path is predicted for Roma.